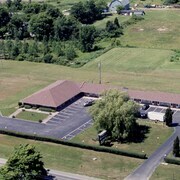 Situated in Welland, this hotel is within a 15-minute walk of Seaway Mall and Niagara Regional Fairgrounds. Niagara College is 1.3 mi (2 km) away. Clean, Friendly helpful staff. Good value for the cost of the room. The pool and resturant was very nice. The resturant even let us borrow a couple plates and utensils for our brought meal. They also had pictures of famous people that had stayed at that same hotel, pretty neat! Staff was friendly and was easy to check in and out. Would book again with them if we are back in town. Where to find Dunnville hotels near an airport? Where can I find hotels in Dunnville that are near tourist attractions? If you'd like to stay near the center of Dunnville, there are a limited number of options. Dunnville offers 3 hotels within a 0.1-kilometre (0.06-mile) radius of the heart of town. Some hotels that are not all that far from the center of Dunnville are the Riverview Motel and Maitland Shores Trailer Park & Marina. The Carrousel Bed & Breakfast and the Oakwood Escape - Campsite are two Expedia-listed accommodation options worth investigating. 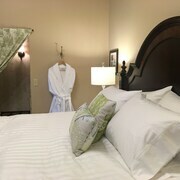 The Carrousel Bed & Breakfast is situated 20 kilometres (13 miles) from downtown Dunnville and the Oakwood Escape - Campsite is situated 8 kilometres (5 miles) away. The Wainfleet Motel & Restaurant is one more comfortable option. 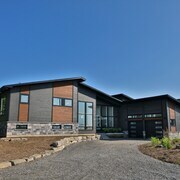 It's positioned 20 kilometres (13 miles) from the heart of Dunnville. Like to venture a little further afield? Southern Ontario has many options. Spend time at Southern Ontario's traditional villages, churches and art museums and enjoy the area's beaches, coastal plains and forests. Visitors in this section of Canada commonly enjoy skiing. Burlington is 50 kilometres (33 miles) to the north of Dunnville and is home to the Royal Botanical Gardens and Burlington Art Centre. The Waterfront Hotel Downtown Burlington and Holiday Inn Burlington Hotel & Conference Centre are a few of the hotel and apartment alternatives in Burlington. 35 kilometres (21 miles) to the northeast of Dunnville, you'll also find Lincoln, which is home to the Inn on the Twenty, an Ontario's Finest Inn and Jordan House. If you stay in Lincoln, set aside some time to check out the Sawmill Golf Course and Twenty Valley Golf and Country Club. Just because you are on vacation, doesn't mean you can't enjoy your love of sport. You will find Air Canada Centre 90 kilometres (55 miles) to the north of Dunnville. For tourists who are keen on booking a room close by, make a reservation in the The Ritz-Carlton, Toronto or Four Seasons Hotel Toronto. Are you looking for the most convenient airport for your trip to Dunnville? John C. Munro Hamilton International Airport is 40 kilometres (25 miles) away. What are the most popular Dunnville hotels? Are there hotels in other cities near Dunnville? 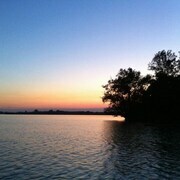 What other types of accommodations are available in Dunnville? Explore Dunnville with Expedia.ca’s Travel Guides to find the best flights, cars, holiday packages and more!